My singles chart is coming back on October 14th (still trying to load everything into excel) but for now enjoy the latest certified albums. Notes: This result definitely surprised me. I've always liked Rihanna's tunes but the fact that this, her 'proper' comeback song only managed one week at the top is quite shocking. In fact, it's the only No. 1 peaking Rihanna song to manage less than two weeks. But looking back, this probably shouldn't have gotten any weeks at the top. A good dance song but honestly a little generic and most definitely the weakest of all the tracks in this list. Notes: I liked Tame Impala's 'Currents' when I first heard it back in late summer 2015 but it wasn't until the release of "The Less I Know the Better" as a single that I finally became immersed in the entire album. After a slow start in late 2015, this track unexpectedly rose 15-1 (re-writing the record for largest jump to No. 1) to dethrone Rihanna's "Work" and ultimately topped my singles chart for 9 consecutive weeks. While that's not the most total weeks at No. 1 in my chart's history, it did set the record for the longest consecutive running No. 1. It is the third longest runner overall, passing "Don't You Worry Child". 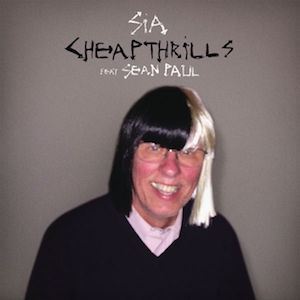 Notes: When I first heard the premiere of this on Beats 1 back in December 2015 I thought to myself "if this isn't a hit for Sia nothing will be". 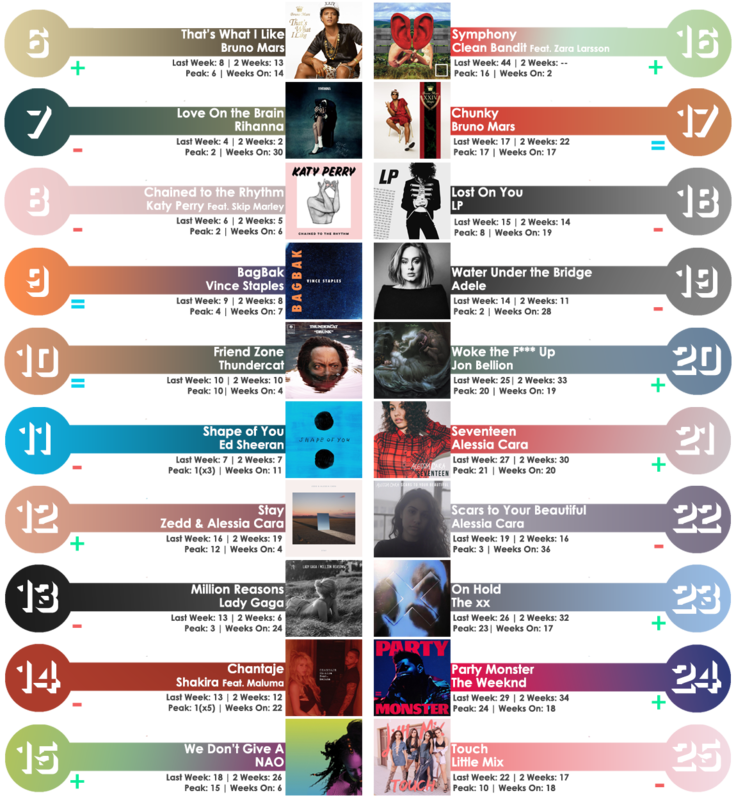 It managed to bubble on my chart but got swept under the rug with all of the excitement and new music in January and February until it got a Sean-A-Paul remix, which (in my opinion) took the song from great to excellent. It topped for two straight weeks, predating its rise to No. 1 where I am by a few months. Ultimately it's one of the most deserving tracks of the year. *Sia's third (second without writing credits) No. 1 and Sean Paul's first No. 1* . *Alicia Keys' first No. 1* . Notes: Ok look. Ariana Grande has never been one of my favorites. Yes she's had some decent pop songs, yes she's had one great pop song ("Love Me Harder"), yes she's had an underserved No. 1 on my chart before and yes she did (arguably) give way for The Weeknd's mainstream career but other than that she's been just average. Until she released "Into You", a complete 180 from pretty much anything she's ever done. A great Summer disco-inspired track, "Into You" had all the markings of a smash hit. Unfortunately it fell victim to Ariana's weakening status at radio and collapsed under poorly structured promotion tactics. Nevertheless, it managed to top my chart for a whopping five weeks across the summer and looks to close as her most successful single ever. *Ariana Grande's second No. 1* . Notes: After the No. 1 showings for "The Hills", "Can't Feel My Face" and "In the Night" on my chart, there was no doubt another single from The Weeknd's 'Beauty Behind the Madness' would enter the top 10. But when "Acquainted" was announced as the fifth single from the era I was pleasantly surprised: it had always been one of my favorites from the album. 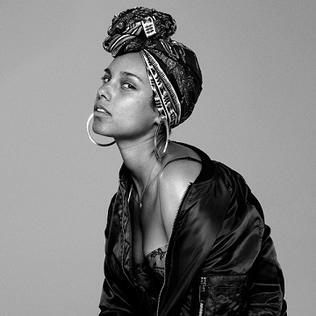 After a slow and gradual climb, "Acquainted" went on to top my chart for a single week (in the middle of the No. 1 run for "Into You"). In fact it didn't reach the pinnacle of the chart until its 23rd week, completing one of the longest journeys to No. 1 in my chart's history. It also took substantially longer than its predecessors: "The Hills" shot to No. 1 in week 3, "Can't Feel My Face" took 15 weeks and "In the Night" took 18 weeks**. Furthermore, the track's ascent to No. 1 made 'BBTM' the first album to produce four chart topping hits -- it previously tied Lady Gaga's 'ARTPOP' and Maroon 5's 'Overexposed', both of which produced three consecutive No. 1s and two additional top 10s (each). **It should be noted that "In the Night" initially peaked at No. 69 and charted for seven weeks as an album cut. Thus, "In the Night" took 11 weeks to peak at No. 1 upon re-entry. *The Weeknd's fourth No. 1* . Notes: Usher has been behind some of the greatest (most successful) R&B/pop crossover songs of all time, but since his fall from stardom in during 2012-2013 I haven't expected much from him. In the past few years he's had a bunch of bloated misfires such as "I Don't Mind" (painfully annoying), "Good Kisser" (somewhat unpleasing), and "She Came to Give It to You" (a hot mess). When he returned with "No Limit" earlier this year I was ready to completely mark him out until I heard "Crash", which would ultimately go on to become one of my favorites of his. Despite being unsuccessful at radio, "Crash" topped my chart for two straight weeks in late Summer. *Usher's first No. 1* . Notes: Similar to the situation with Tame Impala, Twenty One Pilots' "Blurryface" was an album I enjoyed upon first listen in 2015. However, it wasn't until the sudden release of "Heathens" (and of course the radio success of "Stressed Out") that I became more interested in the group. From the time I first heard it, I knew this song would have a lasting impact on my chart and I was right; it commanded the list for three weeks following the drops endured by "Into You" and "Crash". It followed the No. 3 peaking "Stressed Out" and was climbing in the top 10 alongside "Ride". *Twenty One Pilots' first No. 1* . *Lady Gaga's fourth No. 1 (Mark Ronson's second No. 1 and Kevin Parker of Tame Impala's second No. 1)* . Notes: Given the momentum of his last album, I was expecting the return of The Weeknd to be astronomical on my chart; after all, "The Hills" holds the joint record for most weeks at No. 1. Although not as instantly captivating as "The Hills", "Starboy" proved to be more than just a one off comeback. Mixing elements of R&B with Daft Punk's slick electronic groove, the track showed staying power and has spent two nonconsecutive weeks in the top slot. Gaining the spot in its first full week of availability (and second week overall), the track slid back only to recapture the pinnacle from the song it initially replaced ("Perfect Illusion"). *The Weeknd's fifth No. 1 single; CURRENTLY RUNNING* . It's awesome to get a glimpse at your singles chart, and I really love your write-ups here! Well...I may not always agree with the content but they're undoubtedly well-written and an interesting read! Aw, none of this "probably shouldn't have gotten any weeks" talk - it's a TOTALLY deserving No. 1, and I'm glad that you were into it (even if only briefly) ;) Generic, sure, but it's a delicious slice of INCREDIBLY infectious reggae-pop, which Rihanna does like no one else. This was such a refreshing return to form for her after last year's underwhelming experimental offerings. I think this has one of the most instant hooks of 2016, and it'll surely end up as one of my Top 10 biggest hits of the year. This is your only No. 1 that I'd never heard before - and on first listen, it's not bad! It certainly stands apart from everything else on the list. I do like this (No. 5 on my chart, Gold-certified), but I feel like...not only is it basic (as you said), it also lacks the earworm hook that "Work" or "We Found Love" have...at least for me, anyway. Basically: I like it, don't love it. Sweet - another shared chart-topper! It was satisfying to see Sia finally achieve such massive success with her own single, after helping so many other artists score smashes as a writer. What was her other No. 1 (as a performer) here? Similar to TIWYCF, I like this one, but never got MASSIVELY into it. It was definitely a shame to see it flop so hard on official charts, since I much prefer it to some of her previous hits. I've been pretty obsessed with Ari ever since she dropped "The Way", and Yours Truly remains my favorite album of hers...but I'm glad that we can at least agree that this particular song of hers is EPIC! Like "Work", this has been another of my biggest personal chart hits of 2016. I'm surprised to see you call it a complete 180 for her, though, since I'd lump it in with "Break Free" and especially "One Last Time" - but I definitely don't have the most sophisticated/trained ears, so there could be some noteworthy distinctions that I don't recognize. Yet another shared No. 1! Although I don't mind "I Don't Mind", this was Usher's first-ever chart-topper for me too, and his last single to even come close was "OMG." Twenty One Pilots don't do much for me, but I'm certainly impressed by how they've absolutely exploded this year. Kudos to them, for sure. I'd call this one a "grower" too, but sadly it never grew on me enough to reach the top (No. 4, Gold-certified.) I'm still sorting through my feelings about Joanne and this whole shift in sound for Gaga. I definitely don't hate it, and I respect her choice to step outside the box, but I'll miss the sublime dance-pop offerings that made me fall in love with her in the first place. Looks like the ARTPOP era was pretty massive here, eh? DWUW is such a jam - definitely the standout of that album for me. Speaking of shifts in sound, I much prefer the likes of "Can't Feel My Face" and "In The Night" to this or "False Alarm"...but I get that it was probably the right call for him to move away from that HEAVILY-MJ-inspired sound for his next album. I'm still impressed by how massive "The Hills" became, since it didn't strike me as radio-friendly/mass appeal at all. Solid selection overall, Charlie, and I'm really glad you found the time to share it! I really disliked this at first and thought it was a very weak lead single. While it grew on me in the meantime, i still think it's one of her weakest singles ever, so i'm not that unhappy to read it's her number one song with the least amount of weeks at the top on your charts. Kinda similar to "Work", i never got the hype around this. It's still a nice bop though. Great tune! Definitely a highlight of 2016 for me as well, and a deserved big smash for Sia. Great song. It's better than "Stressed Out" or "Ride" for me however it's not their best track. Can't wait to hear what they will bring next, they seem very promising. I definitely agree it was way overdue. She hit #1 with Titanium back in 2012. It was definitely a shame to see it flop so hard on official charts, since I much prefer it to some of her previous hits. It definitely got horrible treatment from radio which was unexpected since it a) sounds like a higher quality version of something pop radio would play and b) Alicia has always been a huge radio staple. I'm surprised to see you call it a complete 180 for her, though, since I'd lump it in with "Break Free" and especially "One Last Time" - but I definitely don't have the most sophisticated/trained ears, so there could be some noteworthy distinctions that I don't recognize. I only meant that it has a sort of disco vibe to it which I don't really see in her other work. She also did a great job on the bridge, an area she's been lacking in with other bangers like Break Free and One Last Time. I may have gone a bit overboard there I just think of I Don't Mind as kind of a sell-out moment to get some airplay (kind of like No Limit this year). Their brand of music is definitely a bit weird and I had trouble seeing the potential at first as well. 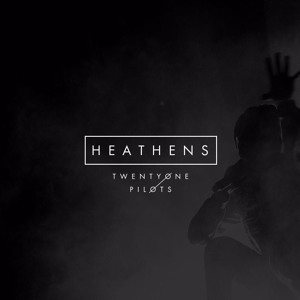 Heathens is far and away my favorite by them to date. This, like TIWYCF, is one of the few 2016 tracks that I think I love the more I play. It's definitely not a normal pop song though so I can see why most people wrote it off. Yeah it was. Although the album overall has aged poorly imo, I still like the singles; Applause was No. 1for 11 weeks, DWUW for six and Venus for one. Although I liked it from the start, I agree. Looking back it's one of her weakest leads. Especially since she had a streak of really good ones (Russian Roulette, Only Girl, WFL, Diamonds and even FFS). It took her a while but she finally found her footing. I just hope the lack of chart success doesn't mean we'll get more tracks like Focus or Side to Side. Months later and I still don't know how I feel about False Alarm :-? I think I Feel It Coming and Party Monster are better than both Starboy and False Alarm but other than that it's a bit difficult. False Alarm definitely had the worst run on my chart of the four though mostly cuz I never hear it except when I listen to the album. So slight delay but the chart is active! 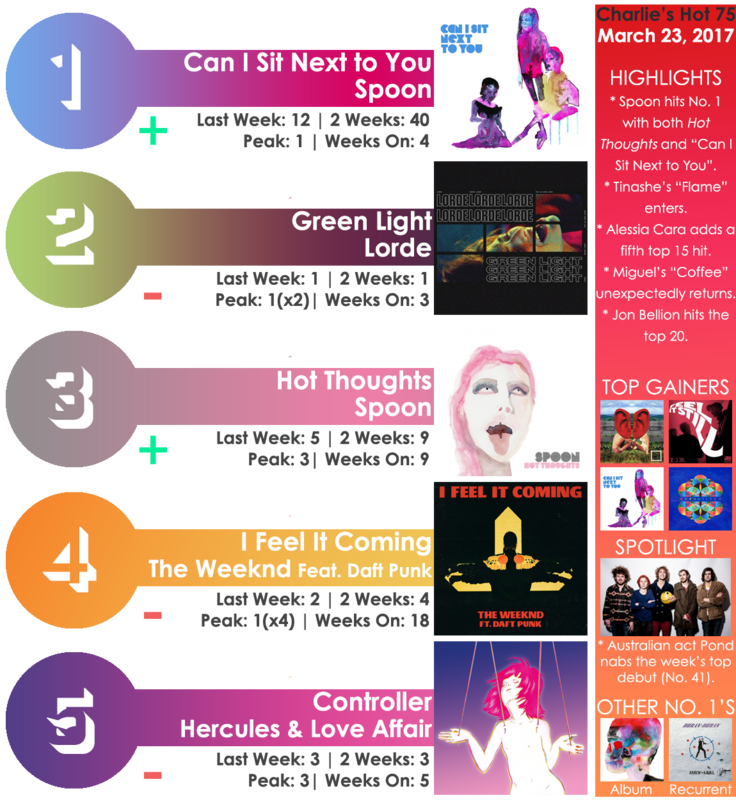 This is the current week's chart but there will be a new update this weekend. As always the chart week is Saturday - Friday. If you have questions about the rules you can check the first post thanks for visiting btw. This week I'm only doing visuals for the top 5. Next week I might do more. Ed Sheeran continues his No. 1 run with "Shape of You", which rebounds in chart after losing traction last week. The track, despite only being in its fourth week, has already made chart history; it set the record for biggest jump to No. 1 when it moved 28-1 three weeks ago. The previous record holder was Adele's "Hello" (22-1). The Weeknd's "I Feel It Coming" is even at its peak of No. 2, despite showing signs of hitting the top slot early in the week. If the track, Abel's 10th top 10, doesn't reach No. 1 it would be his first top 5 entry to miss the summit. He's already notched five No. 1s, including four from Beauty Behind the Madness alone. The 1975 continues to hold with former No. 1 "Somebody Else" (3-3). Currently in its 36th chart week, the track set the record for longest climb to No. 1 after it took 30 weeks to summit. Despite no longer being No. 1, "Else" is holding fairly sturdy racking up a 12th week in the top 10 overall. Shakira's "Chantaje" and Alessia Cara's "Scars to Your Beautiful" remain unchanged in position (holding at No. 4 and No. 5 respectively). The former --- the first ever foreign language No. 1 -- clocks a 12th week in the top 5 and continues to show staying power. The latter continues to be the top 10's most steady entry; it has remained nearly even in points for five weeks in a row. Tove Lo's "True Disaster" marks the first song with any real action this week, pushing 10-6 to a new peak. As noted in the graphic below, this marks Tove's best rank in over a year and half. She was last higher with "Talking Body" in July 2015. Clean Bandit's "Rockabye" is even at No. 7 for a second week, while Adele's "Water Under the Bridge" is up 13-8 to a new peak. In a shock finish that grants Adele her first top 10 week since April 2016 (with "Hello"), "Water Under the Bridge" leapfrogged over the likes of Rihanna, LP and MØ all of whom were leading Adele's disco-influenced track. Consequently, LP's "Lost On You" is up 18-9 which is also a new peak. Rounding out the top 10, MØ's "Drum" slides 6-10 after a short lived rebound last week. Dismissed by the general public and radio alike, "Drum" became a surprise hit on my chart and has spent 15 weeks in the top 10. Hey everyone I'm back (although I might not have been missed ). This is last week's chart so no write up this time. New issue out in the next few days.